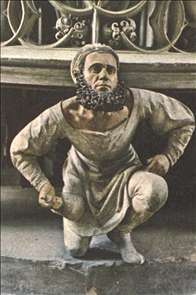 German sculptor, active in Nuremberg. 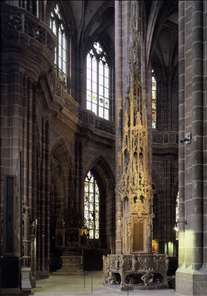 He was a virtuoso stone carver and his most celebrated work, the tabernacle in St Lawrence, Nuremberg (1493-96). is a gigantic stone imitation (c.18 m high) of a subtle piece of goldsmith s work. The richly decorated structure houses a multitude of human figures, animals, amphibia, etc. One of the supporting figures at the base is supposed to be a selfportrait of Kraft. 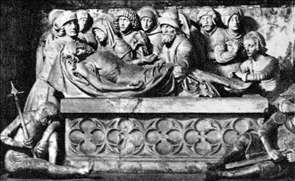 Other examples of his work can be seen in the Germanisches Nationalmuseum in Nuremberg. See more details about "Sacrament House"
See more details about "Self-Portrait (supporting figure)"